Sólo agregar que siempre es un placer y me siento honrado de poder collaborar con Stu. Él es el rey del CSS. This is just a really simple CSS effect I’ve just done. I’m not sure if it is new or not, but it was fun to play with typography. Esto es un efecto muy sencillito que acabo de hacer con CSS. No estoy seguro de si es algo nuevo o no (supongo que no), pero fue entretenido jugar con la tipografía. The comments of G_Morgan asking for a skull and l00pe for adding flames are just so hilarious that I decided to make it real. This is, again, based in CSS displacement maps, and uses mainly CSS 1 and a few properties from CSS 2.1. It works on IE7, IE8, and the most of the latest browser - Chrome, Safari, Opera, Firefox. I downloaded the voxel head medical image from the examples here a long time ago, but they have redesigned the website and I can’t find the link for the data. I also used the same data in my Flash voxel experiment. Please note that I did it as a collaboration with Mr. Doob, and it is stored in his server. Since he decided that his websites should not be shown on Internet Explorer, our common experiment is affected too, so it is not going to work on IE. Este post está inspirado por los comentarios que recibí en Reddit sobre mi efecto de la lata de Coca-Cola en CSS. Varios de dichos comentarios eran humorísticos como suele ser habitual en Reddit. Dos de ellos me hicieron reir muchísimo: una persona dijo algo que se podría traducir aproximadamente como “Ahora lo que tienes que hacer es un efecto con una calavera”. Otra persona agregó: “¡No olvides las llamas!”. En ambos casos eran comentarios irónicos, pero me puse a pensar en lo divertido que sería hacerlo de verdad y… ¡aquí lo tenéis! El efecto se basa en mapas de desplazamiento, al igual que la Coca-Cola. Es principalmente CSS 1 con alguna que otra propiedad de CSS 2 y funciona en todos los navegadores actuales. After talking to Dion Almaer and solving problems with him and Ajaxian, now I feel in friendship with them, and to show it we have done a little collaboration were I’ve done 5 new CSS displacement map effects. Take a look of these here! Adding custom image-based borders for block elements with CSS 1 is painful. It usually requires adding a lot of extra markup that hurts semantics. By other hand, with CSS 3, we have the powerful border-image property, wich allow us to add image-based borders easily, without extra markup and with new visual effects difficult to do with older CSS levels. Unfortunately, CSS 3 is being in development, not all browsers support it, and there is a long way to go until it gets mainstream. I’ve search for middle way to do custom borders without the problem of adding extra markup of CSS 1, and more compatible than with CSS 3 properties. It is possible with CSS 2.1. 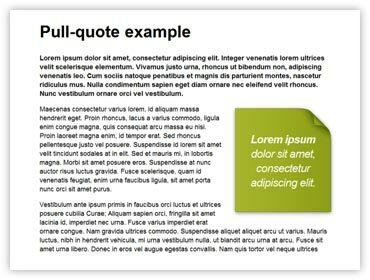 By using the CSS 2.1 pseudo classes :after and :before and setting their content property to an empty string (content: “”;), we can apply a lot of custom borders and background effects to block elements without additional markup. In the example above, I’ve done a pull-quote from a single <blockquote> element, that adapts to its inside text height. So, what are the advantages of this method instead of using CSS3? - Increased compatibility (it works even in IE8). - Using a W3C recommendation - CSS 2.1 - instead of a working draft - CSS3 module border - makes no need for repeating properties in the CSS code for each browser (prefixes -moz, -o, -webkit, and so on). - It is going to be completely mainstream a lot of time before CSS3 will be, so it looks as a more reasonable thing to learn today than the new CSS 3 properties if you are into real life web developing. And… what are the disadvantages? - If you want all the corners with your custom images without adding markup, you will have a width-only resizable block element (looks as a good option for buttons) or an height-only resizable block element (like in my example). - If you use CSS sprites like I did in my example, so you need only one image for the background, then you will be limited in resizing by the height or width of the image. You can always do very long images just as I did in my example. - If you don’t use CSS sprites, you will need more than one image to load, and this is a disadvantage since CSS 3 border-image can work with a single image. In next posts, I will probably follow the trend of showing cool effects and practical uses of CSS 3, but with this post I really want to remember you that there are a lot of possibilities with older CSS levels, and that it is really worth to continue studying them and experimenting with them. After doing the CSS Paper Bird effect, I found out that by a combination of the CSS1 properties background-attachment and background-position, 2D displacement maps could be created and, by scrolling, the displacement map would be applied to different parts of the texture (a background image). With displacement maps lots of cool effects could be done, but thinking that the complexity of the displacement map would directly affect the CSS and markup size, choosing a good example took me some time. I thought in sea waves reflections, underwater distortions, magnifying glass, a rotating Earth… but the final thing I did was just right in my desktop: a Coke can - my favourite drink. Due the cilindrical shape of a can, the displacement map is very simple with the parallel projection I did, so the code is very little - below 5kb - and easy to understand I hope. Even if this effect is mainly CSS1 and some bits of CSS2 - for the scrolling div, overflow: auto property -, it is not going to work in IE6, because it doesn’t support background-attachment: fixed. I’ve tested it and it works in IE8, Firefox 3.5, Chrome 3, Safari 4 and Opera 10. Also, the code validates. Tras crear mi anterior efecto (post anterior a este), describí que con una combinación de las propiedades CSS1 background-attachment y background-position, se pueden crear mapas de desplazamiento y, mediante barras de scroll, estos mapas pueden moverse y aplicarse a diferentes partes de una textura (una imagen de fondo). Con los mapas de desplazamientos se pueden hacer una gran cantidad de efectos interesantes, pero la complejidad del mapa afecta directamente al tamaño del código HTML y CSS. Encontrar un ejemplo apropiado cuya tamaño de código no fuese muy grande pero que produjese un efecto interesante me llevó algo de tiempo. Tras pensar en reflejos de olas, distorsiones submarinas, efecto lupa, la Tierra rotando, finalmente encontré el mejor ejemplo justo encima de mi mesa: una lata de Cola-Cola (mi bebida favorita). Debido a la forma cilíndrica de la lata, el mapa de desplazamiento es sencillo con la proyección paralela que hice en el ejemplo, y por tanto el código es muy pequeño (menos de 5kb) y fácil de entender (espero). Pese a que el ejemplo funciona principalmente con CSS1 (y overflow: auto de CSS2), no funcionará en IE6; no soporta la propiedad background-attachment: fixed. Lo he probado en los navegadores actuales y funciona correctamente, y el código valida. In this experiment I took a serie of paper bird (crane) photos with different illumination positions I did some time ago, and I’ve created a pure CSS effect - without Javacript - to show them one by one depending on the scrollbars positions. Please, drag the thumbs/sliders along the tracks to see the effect. I’ve tried the effect and it works in IE8, Safari 4, Firefox 3.5, Chrome 3, Opera 10 and the code validates. It doesn’t work in IE6. Arrastra los deslizadores de las barras de desplazamiento para ver el efecto. Lo he probado y funciona en los navegadores actuales y el código valida. No funciona en IE6.